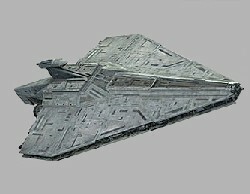 The progenitor of the Star Destroyer line, the Acclamator is a combat transport with atmospheric capabilities. A robust ship capable of fighting its way to the target and delivering a legion of Clone Troopers and their supporting AT-TEs and LAAT gunships, with its introduction at the battle of Geonosis it became the pinnacle of Old Republic starship design. It is said that even in the Republic years many of the older Stormtroopers regretted that scraping of these original ships that served them so well in the battlefields of the Clone Wars. The Acclamator does have two weaknesses according tot he Incredible Cross Sections source material. The configurable quad TLs were inaccurate due to the need to be able to change them between space combat and planetary bombardment modes. And to change from one to the other takes six turns of game time. While in Bombardment mode the quad TLs can't be used against other ships.